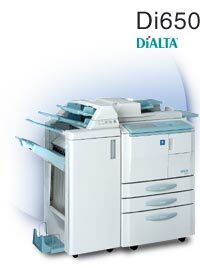 The DiALTA Di650 is designed to meet the punishing demands of print-on-demand (POD) environments, the Di650 delivers 65 pages per minute of perfect-quality prints or copies. In the tandem configuration you can even achieve a system speed of 130 ppm. The output quality has been decisively improved by the use of a unique, brand-new polymerised toner. Its uniform and smooth particles - only half the size (3 µm) of conventional toner - produce images of outstanding sharpness, reproduce thin lines and dots considerably better and ensure smoother halftone gradations. Minolta has precisely the right monochrome production station for efficient POD applications: the DiALTA Di650 delivering immaculate-quality prints or copies.